when the morning light is at it's best. This particular morning was like no other. captivating every bone, and molecule in my body. and watched it fade as the sun continued to rise. my morning? if i had a choice i would always be near the water, at the cottage or on a beach. quietly. with a coffee, of course. good for you, being so determined with your photography. your work is lovely. WOW - that image is amazing...the light, the composition - one of my favs for sure! ww...you have captured that light beautifully. I'm not really a morning person but on the occasions when I do arise early, I appreciate the quietness. Wow, just beautiful. I really love the haiku and the picture, too. So peaceful. Oh my! 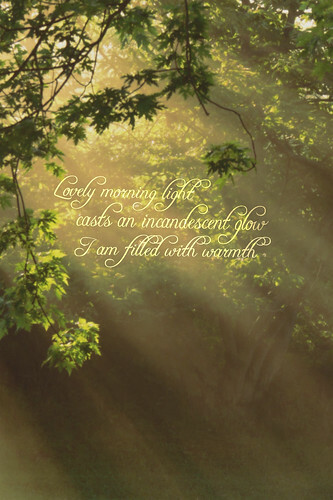 I sooooooooo love this and so feel a connection to the early morning light feeling. Beautiful artistry! Sun? You have sun in the morning? and GREEN? Girl, you lucky lucky girl... I get truck farts, screaming cars and gray pollution dampened by endless damp mist and rain. A hot cup of coffee and prayer time with my best friend over the phone before we start our busy day. Jessica, you are coming along in leaps and bounds. What a joy you are! Great photo - love the new header!